To place your order, simply send us an e-mail at request@ilovevivapops.com and let us know what you need. You may pick up your order at the shop, or special delivery is available for special events. Contact us for a current list of flavors. Qty: 1 – 11 for $3.00 ea. Quantities over 12 receive 10% discount. What says happiness more than a Viva Pops Party for your guests? Keep it chill and unique with our catering options… ideal for weddings, B-day parties, special occasions and staff appreciation events! 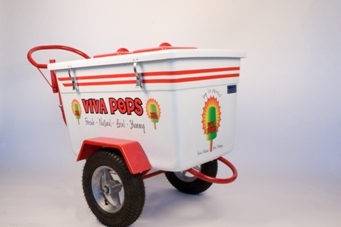 Contact us for details, current flavors and a pop party to go in our adorable Viva Pops carts! You may pick up your order at the shop, or special delivery is available for special events. Contact us at request@ilovevivapops.com for a current list of flavors. If you are interested in carrying Viva Pops and would like to purchase wholesale please send us the following form Wholesale Request Form. A salesperson will be in contact with you to discuss your order details and provide you a quote. Please contact us at request@ilovevivapops.com for pricing information. Rent out our cute carts for your next event. The cart can hold up to 400 pops and will keep your pops fresh and frozen for up to 6 hrs.